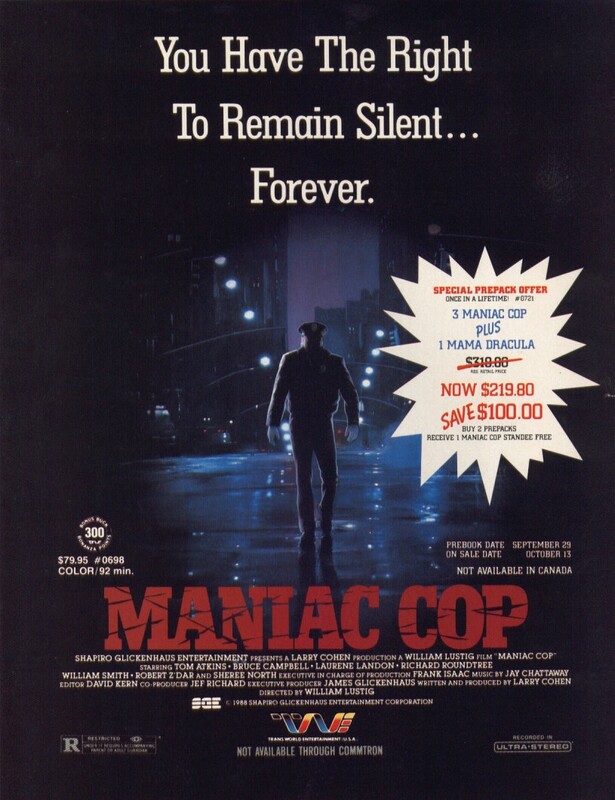 Digi-Schlock: MANIAC COP (Synapse Blu-Ray) – Schlockmania! Video labels big and small are raiding their back catalog for films that can be upgraded to blu-ray status. The quality can vary, depending on the title and the studio, but some companies can be relied upon for consistency in the blu-ray upgrade area. Synapse is one such label and their recent blu-ray reissue of Maniac Cop reveals why they enjoy this status. It offers a genuine improvement in both video and audio and even kicks in a few new extras to sweeten the deal. 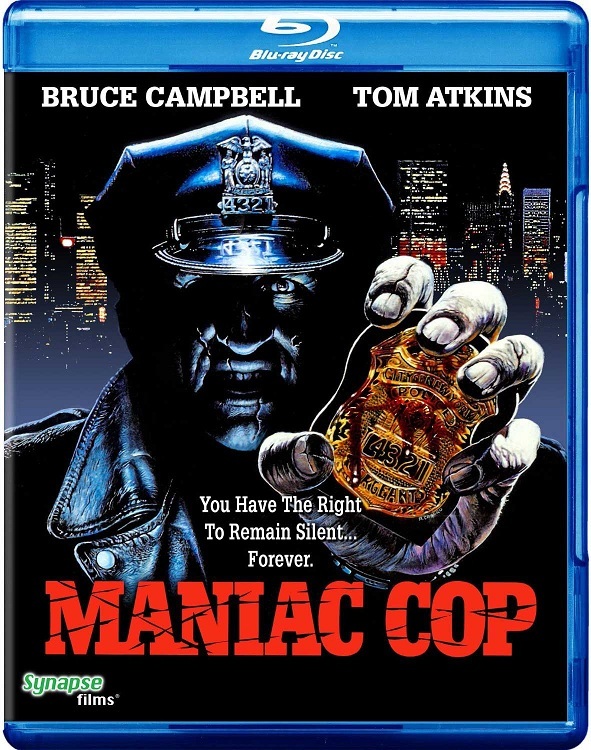 Maniac Cop has been given a new high-definition transfer for this release and the results are pretty impressive. Levels of clarity and color are high but it retains a genuine shot-on-film look, with realistic grain textures to it. Fans will be happy to hear there are three audio options: the original 2.0 stereo mix, a 4.0 mix and a new 6.0 mix. The 6.0 mix was listened to for this review and it’s a very active affair that makes thunderous use of Jay Chattaway’s musical score. It also boasts a few nice surround effects. Fans will love this mix as it really enhances the visceral quality of the experience. 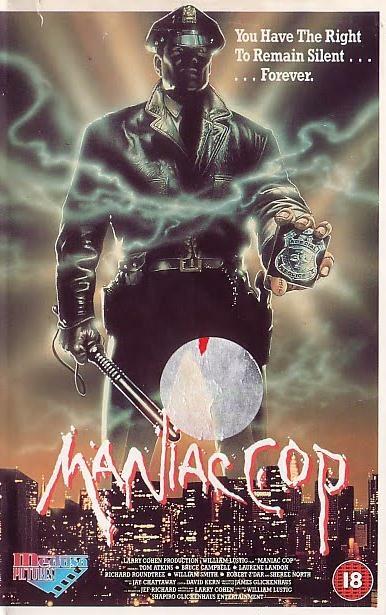 Synapse’s original DVD for Maniac Cop was a fully-loaded affair in terms of extras and several of them are carried over here. For instance, there is a brief series of extra scenes that were added to flesh out the film for a Japanese release. There’s nothing revelatory here but it’s interesting to see how Lustig and crew responded to the need for extra footage by beefing up the films “police bureaucracy conspiracy” angle. There are also theatrical trailers, t.v. spots and even a Spanish radio spot. The best of the previous extras is “Maniac Cop Memories,” an interview with Robert Z’Dar about his titular role in this franchise. For a monster, he’s pretty eloquent and his dry wit makes this segment charming. The one extra from the prior disc not represented on this blu-ray is a commentary track with Lustig, screenwriter Larry Cohen and star Bruce Campbell. It’s a shame this track didn’t make the cut, as it is a lively affair and boasts three of the best talkers in the cult movie commentary business. That said, it’s nice to see a few new featurettes added into the mix. The first is “Three Minutes With Danny Hicks,” an interview with an actor who plays one of Campbell’s cop colleagues in one scene. It’s brief but amusing, with Hicks paying tribute to Campbell (who got him the gig here), how excitable Lustig was when directing action and also relating the joys of smacking Campbell around on camera(!). Even better, legendary genre character actor Tom Atkins gets to offer his two cents on Maniac Cop in “Out The Window.” This 11-minute chat finds the genial actor offering his thoughts on the film and working with Lustig: he manages to be critical without seeming difficult or snide. He also shares a few funny anecdotes about his life as a character actor. In short, this is a worthy upgrade on Synapse’s previous DVD of this title. The missing commentary might bother those who didn’t get that DVD but the transfer is the most important thing on a blu-ray – and this one delivers the goods in both the video and audio departments. 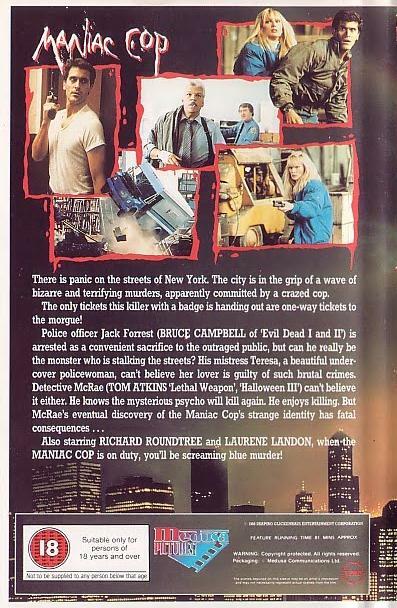 The added extras offer a further boost in value, making this disc well worth the cash for Maniac Cop fans.